Those of us who love the Fast & Furious franchise for its gonzo refusal to commit to any kind of rational naming convention have a new reason to be happy: the follow-up to the film officially titled Fast & Furious 6, but identified Furious 6 onscreen, has been advertised as Furious 7, but in the movie, we find it called FuriousSeven, complete with the not-at-all incidental lack of a space between the words. Those of use who love the Fast & Furious franchise for all the other things have reason to be happy as well: it's pretty great. Or at least, it's pretty much exactly the movie it should be, even with all its lumps and missteps. There's nothing in it that can compete with the "dragging the bank vault" scene from Fast Five or the "endless runway" scene from FF6, and it commits one of the worst structural sins that an action movie can: its most enthralling, well-constructed, and original setpiece comes early on, leaving more than half of the runtime devoted to many perfectly fine action sequences that can't help but feel a little anticlimactic. Even the actual climax, in which the whole ensemble drives through the entirety of downtown Los Angeles while being chased by a helicopter and a missile-launching drone. It's got scale, and it's got duration, and it's got a host of individual character beats that are perfectly timed (allowing that in a movie like Furious 7, car tricks and gunplay qualify as "character beats"). But it's missing the, forgive me, the furiousness of that wonderful central sequence that begins by tossing five cars out of an airplane (without CGI!) and proceeds to raise the stakes from there. The franchise already having transformed from a rather crummy if high-spirited series of racing crime movies into a series of globe-trotting heist picture with the (itself rather crummy) Fast & Furious (the fourth one, from 2009), Furious 7 commits to the shift started in FF6 of turning into, basically, Mission: Impossible with cars (down to a setpiece taking place on a giant skyscraper in the UAE). The basic situation: after Dominic Toretto (Vin Diesel) and his beloved polyglot extended family defeated mercenary terrorist Owen Shaw (Luke Evans, appearing here in a wordless, one-shot cameo), they were all set to retire to quiet lives, with their criminal records having been expunged. But Shaw's older, meaner brother Deckard (Jason Statham) - Deckard Shaw! when was the last time we had an action movie bad guy with such a perfect action movie bad guy name? - comes hunting to get revenge, first sending DSS agent Luke Hobbs (Dwayne Johnson) to the hospital while stealing the files identifying Dom's crew. Then it's off to Tokyo, to kill the unseen Han, and alerting Dom to his presence via a snotty phone call that Dom interprets as a death threat just quickly enough to save himself, his sister Mia O'Conner (Jordana Brewster), and Mia's husband Brian (Paul Walker) from a bomb sent to the Toretto homestead in Los Angeles. Fighting a world-class murder genius like Shaw seems hopeless, until his first head-to-head meeting with Dom is interrupted by the shadowy black ops forces of a smiling older man calling himself Mr. Nobody (Kurt Russell). He comes with a deal: if Dom and crew can help him to steal a stolen surveillance program back from an African druglord named Mose Jakande (Djimon Hounsou), he'll let them use his organisation's resources to find and stop Shaw. And thus begins a trek that leads to Eurasia and Abu Dhabi before rounding back to Los Angeles, while Shaw and Jakande combine forces to stop our plucky heroes. Of course it's convoluted and stupid; just enough to be playful, I'd say. The Fast & Furious movies have had an enormously weird relationship to tone, with the straight-faced, tongue-in-cheek portrayal of the over-elaborate plots of the last couple of movies being goofy enough to support the outlandish, cartoon action sequences, while the greatly sincere treatment of the characters by the filmmakers and the actors who very clearly believe in these roles with all of their generally limited talent ends up being enough to make us care about the stakes in spite of how utterly loopy and implausible the events are. That's particularly important for Furious 7, which was only around halfway through production when Walker died in an unrelated car accident. The film entirely shifts its last minutes to stop functioning as a narrative and instead act as a big, gooey straight guy tearjerker that lets the cast, the characters, and the audience all say goodbye to Walker, and by God, it works: Diesel has almost nothing but liabilities as an actor, and he's best when he's playing a kind of sluggish, threatening sarcasm, but the quavering in his voice as he delivers his closing monologue is legitimately tender and sad and sweet. 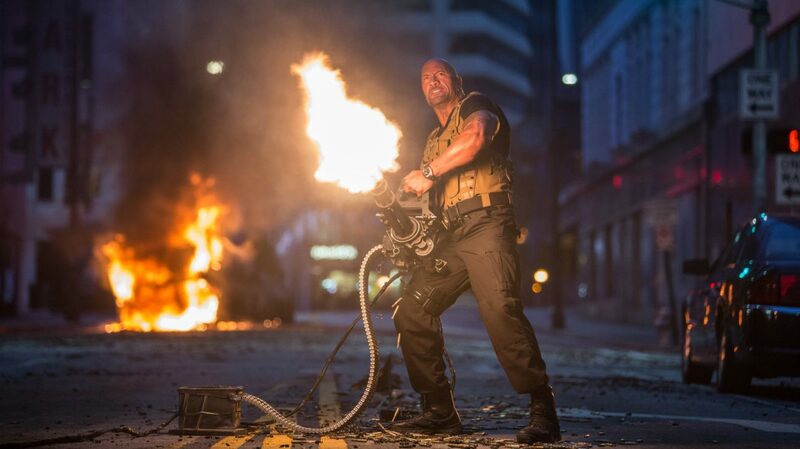 The slowed-down character beats end up devouring quite a lot of the film's much too generous 137-minute running time, and particularly in its first half, Furious 7 seems to be missing the boat on its promise to provide a non-stop explosion of automotive spectacle. Because, sincerity is nice and all, but these aren't the most nuanced dramatic actors in the world, and the plot can veer towards the utterly hokey - everything surrounding Dom's girlfriend Letty (Michelle Rodriguez) and her amnesia groans under the weight of how very much Chris Morgan's screenplay believes in it - and there's only so many ways Diesel can purr the same emphatic statements about the importance of family. So it's a relief when we get things like Russell's splendidly robust supporting turn, giving a vital blast of comic energy (he perfectly delivers the film's best visual joke, a bit of product placement so on-the-nose that it goes ridiculous), or the presentation of the menacingly implacable Shaw (Statham can do this kind of snappish outrage in his sleep, but it's still fun) in terms that suggest a slasher movie killer, appearing and disappearing at will. It leavens the thick, syrupy human drama without actually cheapening it. Obviously, the draw of these films is the action, vehicular and otherwise, and Furious 7 has plenty of both once it finally discards character beats for momentum, though it suffers a bit from new director James Wan and his four editors, who tend to chop up all the fist fights more than they deserve. There are no points where the action necessarily becomes impossible to follow, but in a scene like the Johnson/Statham fight that mostly kicks things off, it would be gratifying to have a little bit less speed and a little bit more physical context. The car scenes are all immensely well-choreographed, though, and even in the most generic setpieces there are grace notes like Wan's tendency to flip the camera on its head along with the fighters, or the opening of the Diesel/Statham fight near the end, which composer Brian Tyler cheekily scores with a dramatic, operatic chant. If the spacing of the action isn't quite perfect, and the film spends its whole second half failing to match the extraordinary blend of creativity and technical elegance of its central sequence, involving aerial practical effects, wholly invisible CGI, a combination of driving action, gunplay, and fist fights, and the welcome presence of the otherwise under-used Tony Jaa (one of the great martial artists in film today, who deserved better for his American debut); well, that's a lot to live up to. The Abu Dhabi sequence is almost as inventive and cut better, while also feeling more oriented around the characters' personalities than their skills. And the L.A. finale... it's kind of too sprawling, actually, and it's one of the few places in the film where the effects let it down. But it's pace beautifully for something that goes on so long, and it at least gives Johnson, who till then seems to have been largely resigned to a brief cameo plenty of fun, ridiculous scenes to play. There's no discipline to any of this: the film jerks along, the links between scene don't always make sense, and it includes a weird insertion that does nothing but re-incorporate the franchise's third film, The Fast and the Furious: Tokyo Drift, into continuity, and confirm that its star, Lucas Black, remains charmless. But its messiness feels so off a piece with the larking attitude that the cast exudes - for them, it's clearly a chance to hang out and goof around, and that radiates out of the film. It's the key difference between the noisy addle-minded nonsense of Furious 7 and the nonsense of the Transformers franchise, say; the sense that everybody involved loves what they're doing and is grateful to have the chance, instead of grimly marching through the steps needed to cash a big paycheck. Sincerity cuts all ways, and for all its flying cars, corny situations, and hypertrophic musclemen whaling on each other with wrenches, Furious 7 is never, for a single frame, any less than 100% sincere.